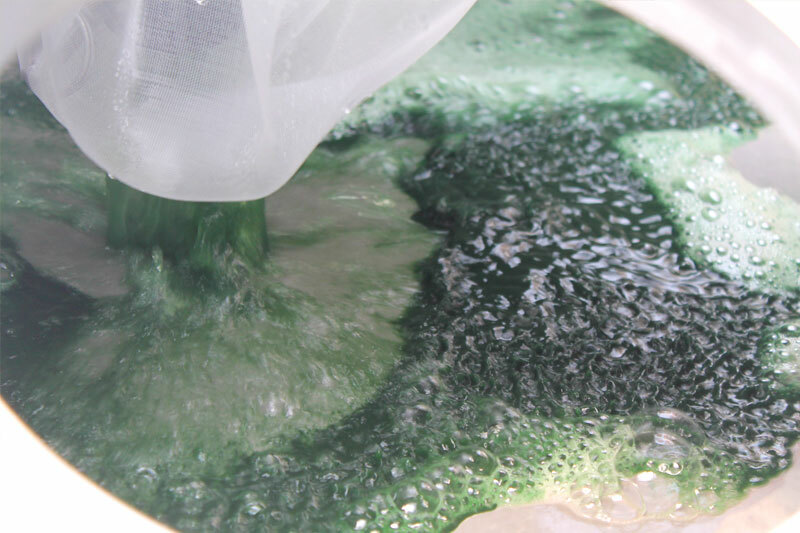 n order to grow, the microalgae need light, nutrients and favorable climatic conditions, as well as a "culture medium" in which to contain nutrients. In our production system, this medium is the water present in four large tanks, each of which can contain an average volume of 48 cubic meters, for a total of 192 cubic meters of microalgae culture that reproduces during the whole year. The cogeneration plant inside our company allows us to have hot water at 90 ° C which is conveyed inside the greenhouses, keeping the tanks in the optimal temperature conditions for the growth of spirulina. The water contained in each tank is moved with blade handling systems, in order to avoid stagnation and to improve the growth of the microalgae culture, allowing the recirculation of nutrients dissolved in water and a greater contribution of carbon dioxide from the atmosphere. Inside the greenhouses and tanks we have installed systems for the detection of the most important indicators of "wellbeing" of the crop, in order to always monitor the progress of production. The data collected are processed and managed, even remotely, so that we can develop timely solutions to improve the final product. 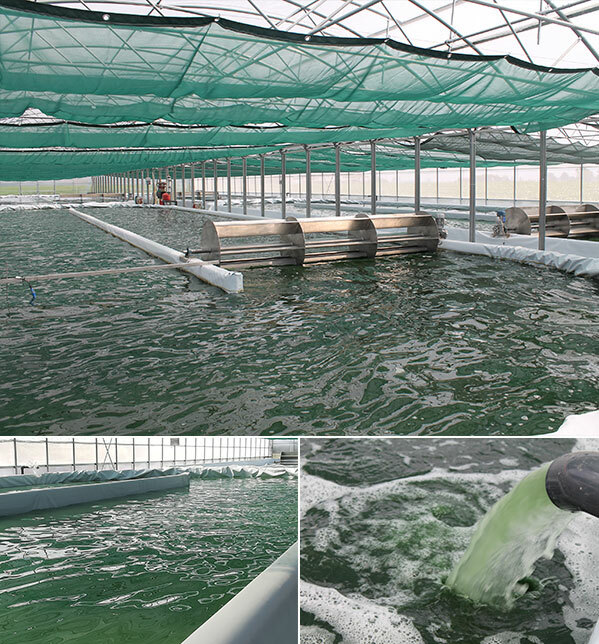 - The filtered liquid, which is re-introduced into the tanks, as it is still rich in salts and nutrients useful for the growth of the microalgae. 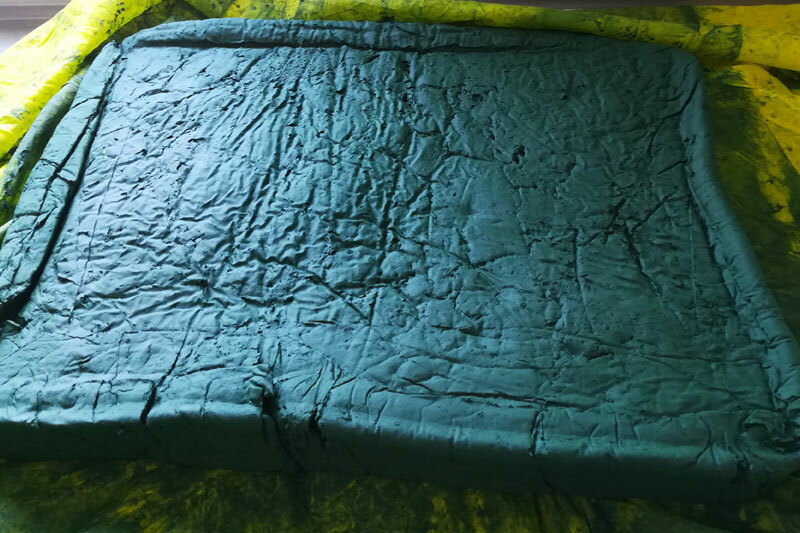 The moist algal mass is collected in bags of food cloth and subjected to a gentle pressing in order to reduce its initial moisture content. 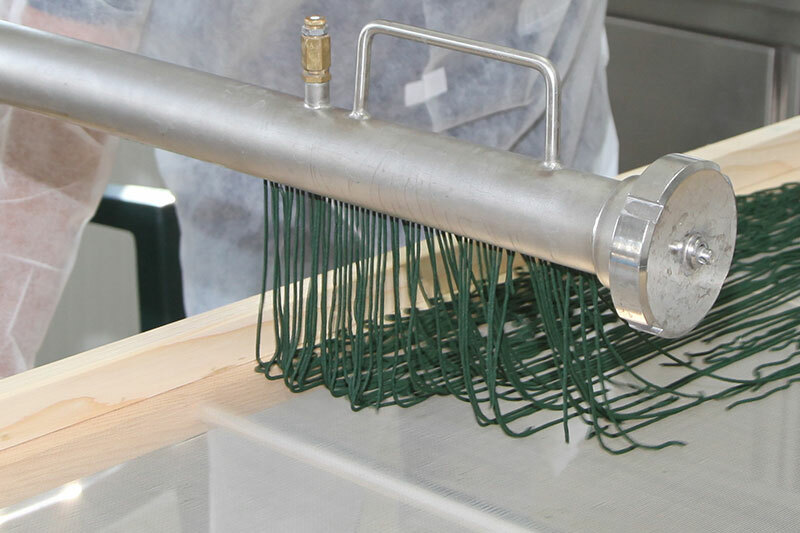 The seaweed paste is inserted into a wire drawing machine that permits us to obtain noodles of a small diameter (about 1.5 mm thick in a wet noodle), an excellent solution to allow dehydration at low temperatures that will further reduce the humidity of the product without deteriorating its nutritional properties. 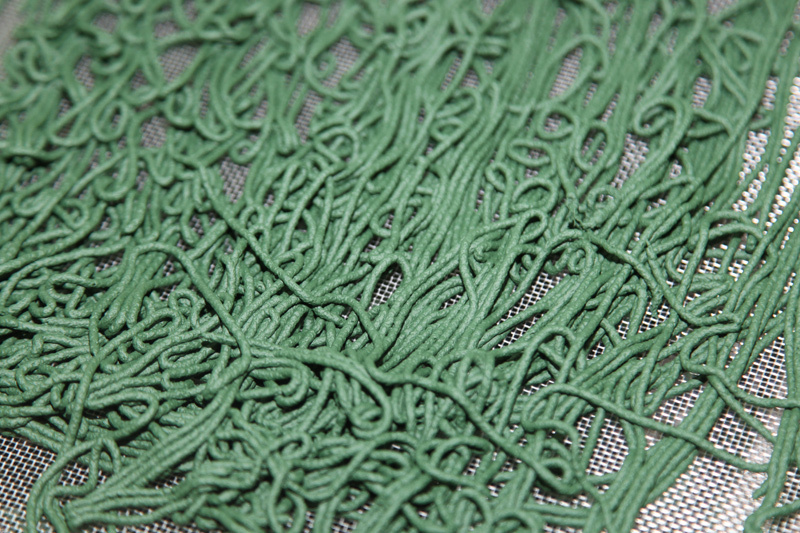 The seaweed noodles are placed in special food frames and sent to the drying cell, fed with the heat of the biogas plant. 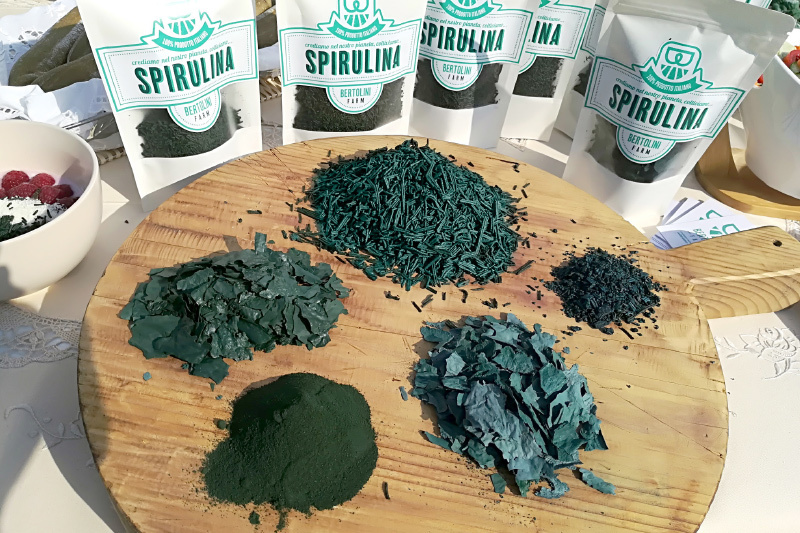 Our dehydrated organic Spirulina is proposed in three formats with the same beneficial effects: flakes, noodles and powder in stay-fresh stand-up pouches..
Noodle and flake forms are suitable for raw culinary creations, while powdered spirulina is used in the foodstuff and cosmetic industries and for the production of food supplements. Vegetable capsules are ideal for sportsmen, students and all those who live a life “on the go”: a practical and comfortable format, easy to dose.